Recently, parking problem has arisen due to an increase in the number of vehicles and insufficient supply of parking lots. This problem occurs tremendously in old downtown residential areas. Problems like insufficient supply of parking lots due to parking on both site of the streets and illegal parking such as visit parking happen regularly. To solve these problems, some municipalities are implementing Residential Parking Permit Program (RPPP), which provides parking permit for nearby residents. The RPPP system provides a parking space for specific applicants, such as residents and merchants, for a certain period of time, so only permitted vehicles can park. However, the problem with RPPP is sometimes parking lots provided to the permitted vehicles are left unattended. Thus preventing other vehicles to park even if there are available parking spaces. Accordingly, this study suggests a new method called Block type RPPP to solve the problems and increase parking efficiency. This method address parking space as parking zones instead of parking lots and the parking zones classify into “RPPP’s Exclusive Zone” which dedicated for permitted vehicle and “Visitor’s Share Zone” for unauthorized vehicles such as visitors. 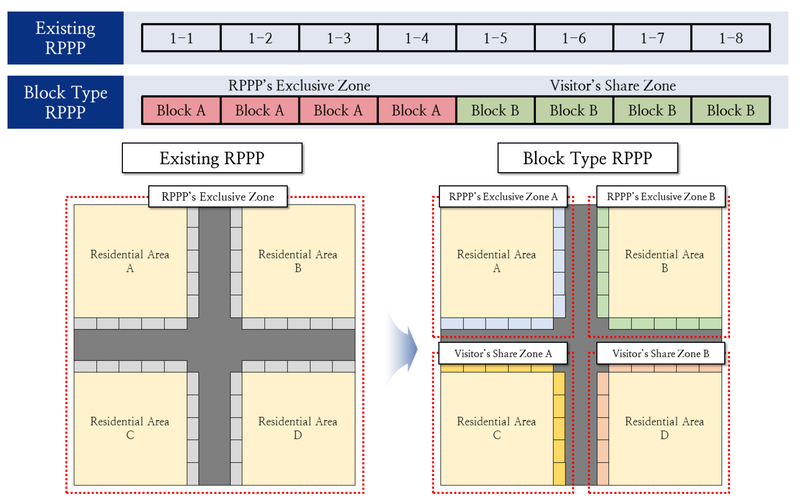 Therefore, this study investigates the number of RPPP parking vehicle, illegal parking, and dishonest parking in the places where RPPP is implemented and compares the existing RPPP system with the block type RPPP system. As a result by a simulation using the VISSIM, Block type RPPP system increased the parking efficiency compared to the existing RPPP system. 현대 도시는 자동차수 증가, 주차공급 부족 등으로 주차문제가 발생하고 있으며, 구도심 주거지역에서 보다 심각하게 주차문제가 발생하고 있다. 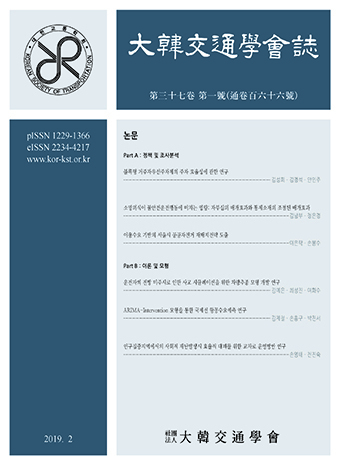 구도심에서는 주로 이면도로 등에 주차를 하고 있으나 주차면 부족, 방문주차 등으로 불법주차가 빈번히 발생하고 있다. 이러한 주거지역 주차문제 해결을 위해 일부 지자체에서는 인근 거주자에게 주차면을 제공하는 거주자우선주차제를 시행하고 있다. 거주자우선주차제는 일정기간 거주자, 상인 등 특정 신청자에게 전용 주차면을 제공하는 제도로 허가차량만 주차가 가능하다. 그러나 허가차량에게 제공된 주차면 미사용 시 방치되거나 미허가차량의 주차로 허가차량이 주차를 하지 못하는 부정주차가 발생하고 있다. 따라서 본 연구에서는 블록형 거주자우선주차제라는 새로운 방안을 제시하여 문제점을 해소하고 주차 효율성을 증대하고자 한다. 블록형 거주자우선주차제는 주차면이 아닌 주차구역으로 구분하여 거주자우선주차제 허가차량을 위한 전용구역과 방문객 등 미허가차량을 위한 겸용구역으로 주차구역을 구분하는 방식이다. 이에 거주자우선주차제를 시행하고 있는 대상지를 선정하여 허가차량 주차대수, 불법주차, 부정주차를 조사하고 기존 거주자우선주차제와 블록형 거주자우선주차제 운영방안을 비교하고자 한다. VISSIM을 활용한 시뮬레이션 분석 결과 블록형 거주자우선주차제는 기존 거주자우선주차제 대비 주차 효율성이 증가하였다. This study examined the relationship between vocational calling and bus drivers’ unsafe driving behaviors and the roles of job pride as a mediator and locus of control as a moderator. Questionnaires were distributed to 195 Korean bus drivers. This study revealed that both vocational calling and job pride explained bus drivers’ unsafe driving behaviors. In addition, the mediating effect of job pride and moderating effect of locus of control were also significant. The result of moderation analysis demonstrated that in case of drivers with external locus of control, the higher their job pride was, the less their unsafe driving behaviors were, whereas there was no relationship between job pride and unsafe driving behaviors in case of drivers with internal locus of control. The study findings suggest bus drivers should receive special education facilitating their vocational calling and job pride. 직업운전자의 교통사고는 일반 운전자의 교통사고보다 발생빈도가 높고 다수의 생명과 관련되어 있기에 특별히 관심을 기울여 관리해야한다. 본 연구는 직업운전자의 불안전운전행동에 영향을 미치는 요인으로 소명의식을 상정하고, 직업운전자의 소명의식이 자부심을 증가시켜 불안전운전행동에 미치는 영향을 미치는지, 그리고 운전자의 통제소재가 이를 조절하는지를 살펴보았다. 총 195명의 버스 운전자들이 연구에 참여하였다. 연구결과, 직업운전자들의 자부심은 소명의식과 불안전운전행동의 관계를 매개하는 것으로 나타났으며, 운전자의 통제소재가 자부심과 불안전운전행동 간의 관계를 조절하는 것으로 나타났다. 구체적으로 외적 통제소재가 높은 운전자의 경우에는 자부심이 불안전운전행동이 유의미하게 낮추지만 내적 통제소재가 높은 운전자에게는 이러한 관계가 관찰되지 않았다. 아울러 전체적인 조절된 매개모델도 유의미하였다. 본 연구의 결과는 직업운전자들의 안전운전 교육에 직업 소명의식과 자부심, 통제소재 등 고려할 필요가 있음을 시사한다. The importance of non-motorized transportation has increased in urban transportation systems as interest in environmental issues such as climate change has arisen. The public bike-sharing system in Seoul was born as part of efforts to improve the issues. Another problem, however, has occurred in the use of bikes due to the imbalance of demand-supply of public bikes at each station. In this study, an optimal rebalancing strategy was established based on the estimated rent-return demand of each station in the purpose of keeping the inventory at a certain level. The optimized model by MATLAB programming uses the integer programming method to estimate the number of bike. The strategy consists of three stages. First, drop-off stations were selected through estimated rent-return demand. Second, clustering method was implemented to improve the efficiency of the process of finding the shortest rebalancing route. Third, the direction of the route is determined centering around the drop-off stations, and optimized route is proposed by selecting nearest pick-up stations for the purpose of fulfilling drop-off. The study was conducted using the data of bike rent-return history in Mapo-gu, Seoul. As a result, the demand satisfaction ratio was 0.82 with 112 of the 136 data were satisfied on the 2-hour peak time. The propriety outcome of the number of docks was 0.47 in that 32 docks out of 68 are appropriately allocated. The coefficient of variation was improved from 1.38 to 1.12 as an index of uniformity of inventory margin. The standard deviation of the frequency distribution curve of inventory margin decreased from 24.9 to 15.7, and F-test was implemented to confirm significance. 서울시 공공자전거 대여시스템은 도시환경문제를 개선하고자 하는 노력의 일환으로 도입되었다. 하지만 서울시의 시스템 운영전략은 지역적 특성, 이용자의 이용특성을 파악하지 못하여 운영 효율성이 낮고 수요-공급 불균형 문제가 발생하고 있다. 본 연구에서는 대여소의 이용특성에 따라 수요를 추정하여 자전거 재배치전략을 수립하고, 이용수요에 맞춰 재고를 일정수준으로 유지하는 방법론을 제시하고 있다. 재배치전략 수립 시 운영차량의 자전거 회수량과 분배량은 정수계획법을 이용한 최적화 모형을 통해 산정되었다. 본 연구는 재배치전략을 2단계로 구성하였다. 1단계에서는 시간단위로 대여소별 자전거 이용수요를 추정하여 운영차량의 대여소별 자전거 분배량을 산정하였고, 2단계에서는 산정된 대여소별 재배치량을 기반으로 최적경로를 도출하여 재배치시간을 최소화하는 방법론을 제시하였다. 재배치전략의 효과는 3가지 지표인 이용수요 충족도지표, 거치대수 적정성지표, 그리고 재고여유분의 균등성지표를 통해 분석하였으며, 데이터는 서울시 마포구의 2017년 11월의 자전거 대여반납 이력자료를 이용하여 1시간 단위로 분석을 시행하였다. 우선 이용수요 충족도의 경우, 첨두시간 2시간동안 전체 68개 대여소 중 각각 57개 및 55개 대여소 재고가 이용수요를 충족하여 이용수요 충족도는 0.82로 산정되었다. 거치대수 적정성지표의 경우, 재배치전략 시행 후의 값은 0.47로 전체 68개 대여소 중 32개 대여소의 거치대수가 이용수요에 대비하여 적절히 배정된 것으로 분석되었다. 재고여유분의 균등성지표의 경우, 대여소별 재고여유 자전거 수의 변동계수는 1.38에서 1.12로 감소되어 19%의 개선효과를 나타내었으며 F-검정을 통해 개선효과의 유의성을 확인하였다. Recently demand for traffic simulation for development and validation of the safety performance of new system increases along with the development of autonomous vehicles. However, the existing traffic simulations with the current car-following models have limitations as they cannot simulate risky situations including vehicle collisions. 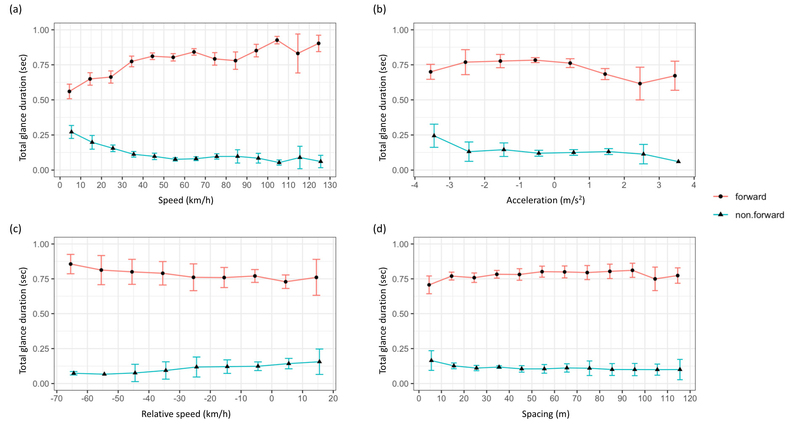 In this paper, we propose a car-following model to demonstrate the driver’s behavior and simulate traffic accidents in line with the demand. Among the various types of accidents, we focus especially on the rear-end collision caused by the driver’s distraction. To model the driver’s distraction, we firstly analyze the diver’s glance behavior using the 100-Car Naturalistic Driving Study data provided by the Virginia Tech Transportation Institute. Various elements affecting the driver’s glance behavior are divided into road environmental and vehicle movement variables according to their temporal range and analyzed differently. Based on the result, a hierarchical decision tree analysis is conducted to derive the driving scenarios by glance behavior. Eleven scenarios are derived, and the driver glance models are developed for each of them. We propose the distracted-OFFA by combining the driver glance model with the base car-following model of Oversaturated Freeway Flow Algorithm (OFFA). The results show that the proposed model can regenerate risk situations including rear-end collisions, and this study has contribution in that it shows the potential to simulate risk situations based on driver’s behavior and to predict accident occurrences. Accordingly, meaningful achievements are expected with further researches. 최근 자율주행 차량 기술의 발전과 더불어 새로운 시스템의 개발과 안전성능 검증을 위한 교통 시뮬레이션에 대한 수요가 증가하고 있으나, 기존의 차량추종 모형을 사용하는 교통 시뮬레이션들은 차량 간 추돌과 같은 위험상황들을 모사하는 데에는 한계를 지니고 있다. 본 논문에서는 시뮬레이션에 대한 이러한 새로운 수요를 반영하기 위해, 운전자의 행태를 모사하여 사고 상황을 비롯한 위험상황을 재현할 수 있는 차량추종 모형을 제안하고자 한다. 특히, 본 논문은 다양한 사고유형들 중에서도 운전자의 전방 미주시 행태로 인해 발생하는 차량 간 후미 추돌사고를 재현하는 것을 목적으로 하고 있다. 먼저, 운전자의 주시행태에 대한 분석을 수행하였으며, 이를 위해 VTTI (Virginia Tech Transportation Institute)에서 제공하는 100대 차량의 일상주행연구 데이터를 활용하였다. 분석 과정에서 운전자의 주시행태에 영향을 미치는 다양한 요소들을 도로 환경 변수들과 차량주행 변수들로 구분하였으며, 계층적 의사결정 나무 분석을 수행하여 주요 변수들을 선별하고 11개의 주행 시나리오들을 도출하였다. 각각의 주행 시나리오별로 운전자의 주시행태 모형을 결정하였고, 이를 과포화 고속도로 교통류 알고리즘(Oversaturated Freeway Flow Algorithm, OFFA)의 차량추종 모형과 결합시켜 Distracted-OFFA를 제안하였다. 시뮬레이션 수행 결과, 새로 개발된 모형이 후미 추돌사고를 비롯한 위험상황들을 재현할 수 있음을 확인할 수 있었다. 본 연구는 운전행태에 대한 분석을 바탕으로 사고재현 시뮬레이션과 사고발생 예측의 가능성을 제시하였다는 점에서 의의가 있으며, 추후 활발한 후속 연구가 필요할 것으로 보인다. The era of big data in the aviation market is coming, and various methods for forecasting air traffic passenger demand along with many data are being suggested. In addition, short and mid-term demand forecasting studies have increased significantly in recent years, whereas existing air traffic passenger demand forecasting studies have been studied in the long-term view. Currently, demand for international air traffic passengers is skyrocketing every year. But air traffic passenger demand in certain countries has fluctuated greatly due to external influences such as national relations. Existing short and mid-term international air traffic passengers demand forecast is mainly used by ARIMA model and Exponential Smoothing method. In the condition that demand data is influenced externally, these models produce inaccurate forecasting result as they can’t consider about the external influences. 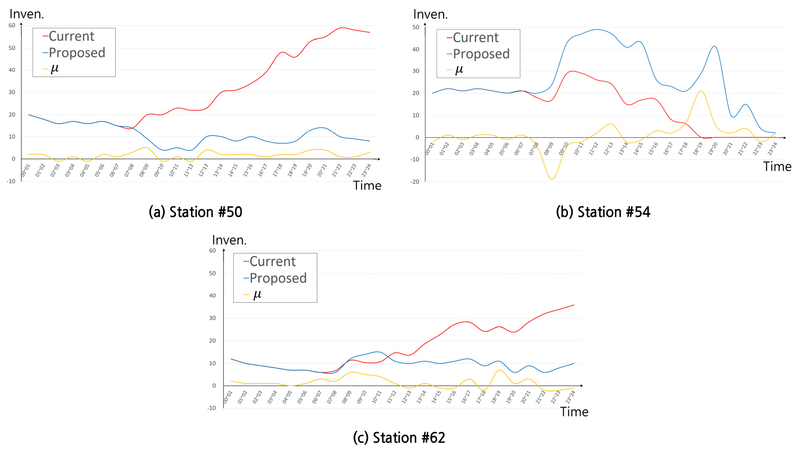 In this study, an improved model is proposed for short and mid-term demand forecast of international flights at domestic airports. This paper introduces ARIMA-Intervention that is improved from univariate time series ARIMA model with the consideration of intervention effect and presents the results of an empirical predictive analysis in respect to the international air traffic passenger demand of the Bottom-up method. In addition, we proposed the process for model selection. Monthly data were used from January 2013 to October 2017 for analysis and this paper presents international air traffic demand forecasting result of domestic airport by combining the forecasting results of air traffic passenger demand on China, Japan, the United States, Hong Kong, Thailand, the Philippines, Vietnam and Taiwan with high demand of international flights and in the other counties. At the conclusion, the prediction results of the model using ARIMA-Intervention are presented with MAPE. Based on the proposed model, it was found that the demand prediction for first half of 2018 resulted an error about 1.78% contrasted with the actual international passenger demand, thus, it is able to confirm that it is highly reliable. Finally, we project the 2019 forecast (Business As Usual, BAU) to increase by about 9.34%. 항공운송시장에 빅데이터(Big Data) 시대가 도래하고 있으며, 많은 데이터와 함께 다양한 수요예측 방법론이 제시되고 있다. 또한 기존의 수요예측 연구들이 장기적 관점에 연구였던 것에 반하여, 최근 중 ‧ 단기적 수요예측 연구가 크게 증가되고 있다. 항공운송시장에서 항공여객 수요에 대한 예측은 시장을 계획하고 운영하는데 있어 매우 중요한 분야로, 특히 공항운영 및 항공사 운영에 있어서 중 ‧ 단기적 수요예측은 미래 운영계획 수립에 있어 우선적으로 제시되어야 하는 요소로 정확한 수요예측 방법론이 제시되어야 한다. 현재 국제선 여객수요는 매년 급증하고 있다. 그러나 특정 국가들의 여객수요는 정치 ‧ 사회적 관계 등과 같은 외부적 영향으로 큰 변동이 발생하였다. 하나의 사례로서 한-중 여객수요는 한국의 고고도 미사일 방어체계(THAAD ‧ 사드) 배치 계획에 따른 조치로, 중국 당국의 2016년 말 한국행 단체여행에 대한 정원의 약 20%가량 축소 및 2017년 3월 중국여유국의 한국 관광상품 판매금지 조치 등으로 급격한 여객수요 감소가 발생하였다. 기존 국제선 여객수요의 중 ‧ 단기 예측을 위한 주로 ARIMA, 지수평활법과 같은 수요예측 모형은 외부적 영향을 고려할 수 없어, 수요 자료가 외부적 영향을 받을 경우 정확도가 낮은 예측결과를 초래하였다. 이에 본 연구에서는 국내 공항의 중 ‧ 단기적 국제선 수요예측 시 개입효과를 사용한 개선된 방법을 고려하였다. 먼저, 단변량 시계열 모형인 ARIMA 모형에서 개입효과를 적용한 ARIMA-Intervention 모형에 대한 소개와 bottom-up (상향식) 방식의 국제선 항공여객 수요에 대한 실증 예측분석 결과를 제시하였다. 또한, 해당 모형 선택에 있어 체계화된 프로세스를 제시하였다. 실증 분석으로서, 2013년 1월부터 2017년 10월까지의 월별자료를 사용하여, 2018년 수치에 대한 검증을 실시하였다. 국제선 여객수요가 높은 중국, 일본, 미국, 홍콩, 태국, 필리핀, 베트남, 대만 노선의 각 여객수요예측 및 그 외 국가의 여객수요 예측을 결합하여 MAPE (mean abolute percentage error)기반 예측정확도를 검증하였다. 2018년 상반기 수요예측 결과, 실제 국제선 여객수요 대비 약 1.78%의 오차가 발생하며, 매우 안정적인 결과가 예측되었다. 마지막으로, 해당 방법론을 사용하여 2019년 전망치(BAU)는 약 9.34% 증가할 것으로 제시한다. Recently, social disasters such as violent demonstrations and terrorism have been increasing in many countries around the world, and as such social disasters occur mainly in populated areas, emergency situations such as direct human casualties and the destruction of road facilities have occurred. In this study, we set up virtual areas and constructed scenarios for social disasters in virtual areas to study optimal traffic control methods to efficiently evacuate from the point of disaster. Traffic flow control measures for evacuation first establish basic operating principles for operation methods by means of signal intersection, which is located on the route to evacuate from the point of social disaster, and derive optimal traffic flow control methods by simulating changes in signal operation. As a result of the analysis, it was found that the effect was similar in the case of entry control and the increase of the green time in the main direction. However, it was the most effective to apply the entry control in case of disaster in the dawn and evening time with relatively low traffic volume. The most effective method is to apply the increase in the green time of the main direction of the main line in the time zone. If an emergency evacuation is required on a road network with many intersections, the shorter the escape time is shown to be the lesser the conflict at the intersection from the origin to the destination, and the lower the conflict at the crossroads within the direct impact zone where the evacuation vehicle is concentrated due to a disaster, the shorter the average travel time. Therefore, in the event of a disaster in a downtown area where many intersections occur, it is necessary to control the flow of traffic so that the conflicting points at the intersection can be reduced as much as possible and the traffic can be dispersed from the site of the disaster to the point of escape. In addition, it is believed that reducing the point of conflict at the intersection of indirect influence lines will be effective in reducing the time of traffic on the escape vehicle. 최근 개인적인 견해의 충돌로 인해 세계 여러나라에서 과격한 시위나 테러와 같은 사회적 재난이 증가하고 있으며, 이러한 사회적 재난은 주로 인구가 밀집된 지역에서 발생하고 있어 직접적인 인명피해와 함께 도로시설물 파괴 등으로 재난 발생지점으로부터 긴급한 대피가 필요한 상황이 발생하기도 한다. 이 연구에서 우리는 가상지역을 설정하고 가상지역에서 발생하는 사회적 재난에 대한 시나리오를 구성하여 재난발생지점에서 효율적으로 대피할 수 있도록 최적의 교차로 운영방안을 연구하고자 하였다. 차량들의 대피를 위한 교차로 운영방안은 사회적 재난이 발생한 지점으로부터 대피하는 도로망내 모든 교차로의 운영변화에 따른 시나리오를 설정하고 시뮬레이션을 통해 효율적인 대피를 위한 교차로 운영방안을 도출하였다. 도심과 같이 교차로가 많은 도로망에서 긴급하게 대피해야 할 경우 출발지부터 목적지까지 교차로에서 발생하는 상충을 감소시킬수록 대피시간이 짧아지는 것으로 나타났으며, 재난이 발생하여 대피차량이 집중되는 직접영향권내 교차로의 상충이 감소할수록 평균통행시간이 짧아지는 것으로 나타났다. 따라서 교차로가 많은 도심에서 재난이 발생할 경우 재난발생지점과 직접 연결되는 교차로의 경우 교차로에서 발생하는 상충지점을 최소화하고 재난발생지점에서 대피지점으로 교통량이 분산될 수 있도록 교통량의 흐름을 통제하는 방안이 필요하다. 이와 함께 간접영향권내의 교차로에서 발생하는 상충지점을 최소화하면 대피차량의 통행시간을 감소시키는데 효과가 있을 것으로 판단된다.